Amazon's Top 20: Which Town Will 'HQ2' Call Home? Which of the top 20 contenders would be the best home to Amazon's planned new headquarters? In this Wednesday, Dec. 20, 2017, file photo, a clerk reaches to a shelf to pick an item for a customer order at the Amazon Prime warehouse, in New York. Amazon announced Thursday, Jan. 18, 2018, that it has narrowed down its potential site for a second headquarters in North America to 20 metropolitan areas, mainly on the East Coast. After more than 200 cities tried to court Amazon in hopes of being chosen as the location for the online retail giant’s new headquarters, the list has been narrowed to 20. A lot is at stake for the chosen city, as Amazon founder and CEO Jeff Bezos has said “HQ2” could create 50,000 jobs and inject millions of dollars into the local economy. 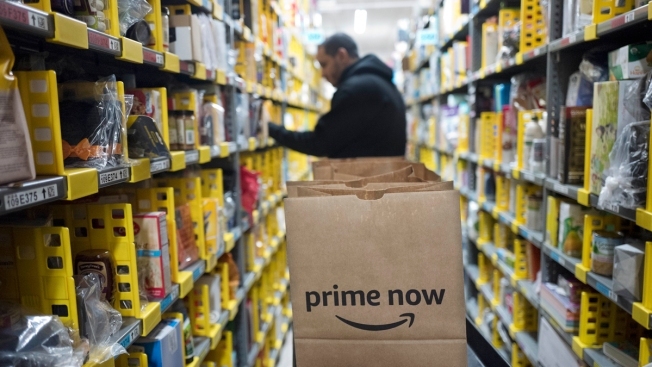 The company said in its announcement Thursday that it will now work with the short-list contenders to see how each stacks up against Amazon’s criteria. The final decision is expected sometime this year. Austin officials said that no local financial incentives were included in the city’s proposal — but that doesn’t mean there won’t be one in the future, KXAN reported. Austin boasts a reputation as a "great place to work with" as shown by its handling of big events like the SXSW Festival, a Greater Austin Chamber of Commerce spokesman told the Austin American Statesman . Although Boston’s pitch did not mention possible tax breaks, it did offer to create an "Amazon Task Force" of city employees working on the company's behalf, including a workforce coordinator to help with the company's employment needs and a community relations official. In a letter obtained by the Chicago Tribune, officials offered to give an estimated $2 billion in incentives to the tech giant and possibly more if it made the final round. Ohio’s capital city has offered Amazon a package of incentives that includes property-tax abatements, income-tax refunds and a transportation plan, according to documents obtained by the Columbus Post Dispatch. Southern Methodist University business expert Mike Davis told NBCDFW that North Texas' advantages include strong universities. Amazon has said it wants to locate HQ2 somewhere with a robust educated work force and experience with other recent successful corporate relocations. Denver’s proposal included several potential sites and financial incentives like job growth tax credits, job training grants and in-state tuition benefits for employees. The public copy of the proposal redacted the potential value of the financial incentives from the state, the Denver Post reported. Indianapolis did not publicly release its plan, and Mayor Joe Hogsett told The Indianapolis Star that city officials "tried to be imaginative and creative.” The Indiana House speaker said politicians could craft incentives to seal the deal. Despite the details of the bid being under lock and key, the Los Angeles County Economic Development Corp. did say there were nine land sites that had the potential to accomodate Amazon, The Los Angeles Times reported. Though details of Miami's proposal remain mostly secret, the state has its own tax incentive to tout. Florida is a no-income tax state, giving it an advantage to other states in the running that are not. Miami-Dade Beacon Council CEO Michael Finney told the Miami Herald the region submitted eight sites for consideration. Montgomery County’s proposal highlighted the area’s highly educated workforce, diverse population and transportation system. The financial and tax incentives the county offered Amazon were redacted. But Maryland's governor said the state's incentive package ran more than $5 billion, The Washington Post reported. Nashville is one of the smallest city contenders and Ralph Schulz, CEO of the Nashville Area Chamber of Commerce described Music City as an "underdog," Tennessean.com reported. But the cost of living is low, and Mayor Megan Barry said she looked forward to making the city's case to Amazon. In pitching Newark, former N.J. Gov. Chris Christie offered $7 billion in tax incentives and property tax abatements, The New York Times reported. But with a new governor sworn in this week, and details of the proposal secret, it is not clear what tax incentives Amazon could receive. New York City said it offered the country's largest tech talent pool, the possibility of education partnerships and a fast commute for workers. Pennsylvania reportedly offered Amazon more than $1 billion in tax incentives, Rob Wonderling, president of the Chamber of Commerce for Greater Philadelphia, told Philly.com. Separately, City Councilman David Oh proposed a bill in September that would grant a city tax exemption to “new mega-businesses” matching the planned headquarter's description. If passed, the bill could save Amazon $2 billion over 10 years. Pittsburgh Mayor Bill Peduto and Allegheny County Executive Rich Fitzgerald have been tight-lipped on what went into the city's proposal. But the officials have expressed optimism: "We have been preparing for this for 30 years," Fitzgerald said in October, according to Pittsburgh Patch. "Our region has tremendous assets that should be appealing to Amazon: a world-class talent pool, high quality of life at a low cost, a stable business environment, and significant capacity to grow." Toronto did not make any tax concession in its bid to lure Amazon across the U.S. border. But the city's proposal highlighted Canada's business-friendly corporate tax rate, noting the combined federal and provincial rate is 12 percent lower than the U.S. average. The District offered Amazon an incentive package that includes relocation reimbursements for workers who move to D.C., wage reimbursements per new jobs filled by military veterans, a $15 million corporate franchise tax exemption, a five-year freeze on property taxes on every building Amazon occupies in D.C., a 10-year exemption on personal property taxes on qualified property and equipment, and a sales tax exemption in perpetuity on its investment in qualified new purchases, according to heavily redacted copy of the bid.